HS for Sale in Brookfield, MA | BRIAN'S TRUCK EQUIPMENT INC. The FISHER® HS compact snowplow is a steel, full blade trip snowplow with removable receiver brackets that will help you plow your home and other small lots on your own schedule. 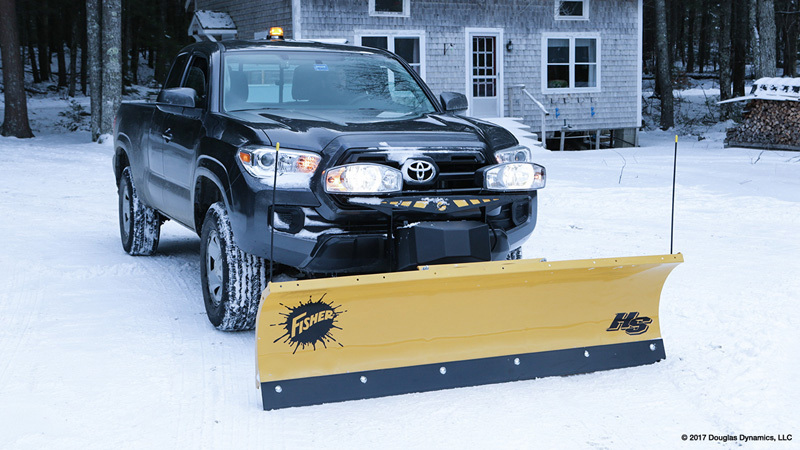 Designed specifically for mid-size pickup trucks and SUVs, the FISHER HS compact plow will have you ready for whatever winter throws your way in Brookfield. The 23½" tall, reliable, 16-gauge, powder coated steel moldboard comes in 6' 8" and 7' 2" widths for rugged snow plowing performance. In other words, you get the brawn of a big plow and yet it's light enough for your mid-size truck or SUV. A standard high-carbon steel cutting edge provides increased wear resistance. The FISHER® Scrape Lock system locks the plow in any position you put it in to give you a cleaner scrape, especially while back dragging. With the plow locked in place, Scrape Lock gives you the performance of a larger plow without the extra weight and without the need to push any extra buttons. Blade Width 6' 8" 7' 2"
Plowing Width (full angle) 5' 11" 6' 4½"
Cutting Edge 1/4" x 5" 1/4" x 5"